"If you could see your whole life from start to finish, would you change things?" That's a brilliant quote from Amy Adams in Arrival, an awe-inspiring sci-fi masterpiece. 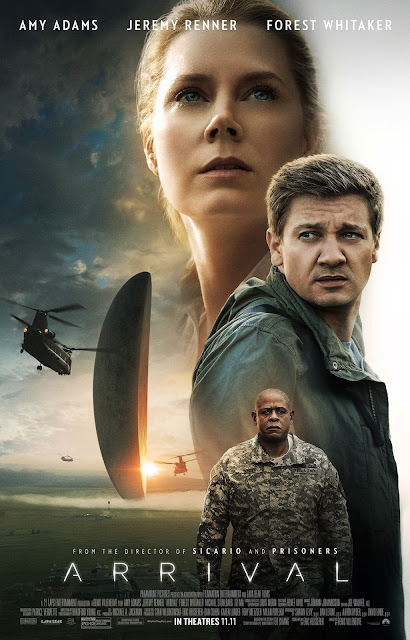 The film is based on the 1998 short story Story of Your Life by Ted Chiang. Adams portrays Dr. Louise Banks, a renowned linguist. Banks is haunted by the past memories of her daughter, who recently passed away from cancer. Due to her translation skills, she is selected by Col. Weber (played by Forest Whitaker) to go to Montana to help communicate with an extraterrestrial spacecraft (nicknamed "Shell"), one of 12 that have landed on Earth. Also selected to help is Ian Donnelly (played by Jeremy Renner), a theoretical physicist. After first contact with the aliens (nicknamed Heptapods for their seven arms) come to the realization that communicating with the Heptapods through spoken language is impossible, so they then try to communicate through written language. The aliens' written language is composed of circular symbols, which proves complex when the aliens create a message that sends many of the countries into a panic. The cast, especially Adams, was amazing. Denis Villeneuve's direction is absolutely amazing, with this being his best film yet, even better than 2013's Prisoners & 2015's Sicario. Eric Heisserer's screenplay is excellent. The film editing by Joe Walker is astonishing. The film score by Jóhann Jóhannson is excellent. The cinematography by Bradford Young is breathtaking. The sound mixing & sound editing is brilliant. And the visual effects are eye-opening. This is the year's best film so far, & years from now, this will be considered to be one of the greatest sci-fi films of all time, along with 2001: A Space Odyssey, Star Wars, Close Encounters of the Third Kind, Alien, Blade Runner, & The Terminator.